This audio-visualization of Wikipedia sounds out edits to the site in real-time. 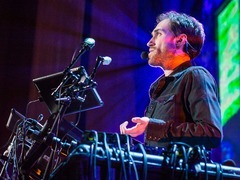 Beardyman: The polyphonic me In the spirit of today’s euphonious talk from Beardyman, and our companion piece of the weirdest sounds to grace the TED stage, celebrate all-things-music with this incredible audiation of Wikipedia. The world’s largest crowd-sourced encyclopedia got a little more melodious this week, when Stephen LaPorte and Mahmoud Hashemi of Hatnote turned the cacophony of information on the site into a serenely harmonious concert in real-time. Inspired by a recent TED Radio Hour episode on collaboration, they wanted to try out the ideas for themselves. The audiation captures the energetic whir of the wiki as it tracks edits to the site. Bells ring when information is added, and strings strum when content is subtracted. The deep echo of an orchestra sounds out with each new user who signs up for the site. Listen to Wikipedia (L2W) encourages users to compare the differences between revisions to individual articles and to welcome new users to the site by writing them a message. The audiation is available in 11 unique languages, including Bahasa Indonesia, and tracks human users and autobots alike. I’ve read some just right stuff here. Definitely worth bookmarking for revisiting. I surprise how a lot effort you place to make any such excellent informative site.